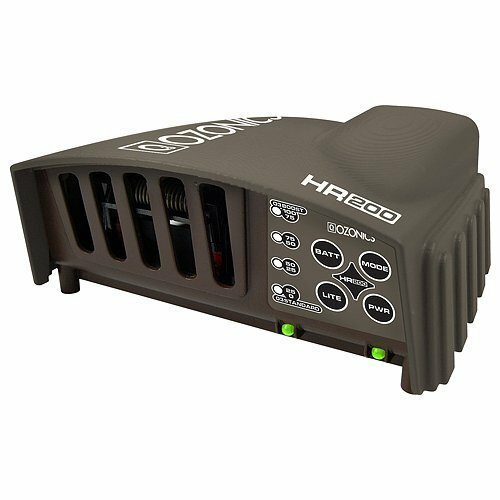 Scent elimination devise-boost the ozonics HR200 give you two modes: a boost mode for tree stand hunting (the entire human profile is presented to the wind and requires more Ozone) and a blind or standard mode. It also comes with mounting systems for both versions. This scent eliminator mounts above you in the tree or to the roof brace on the ground blind (mounts included). silent tough switches for quiet operation and on demand battery level indicator features 4 LED's for easy monitoring. Uses 12 volt rechargeable battery (5 hours run time and 4 hours in boost mode) charger included.